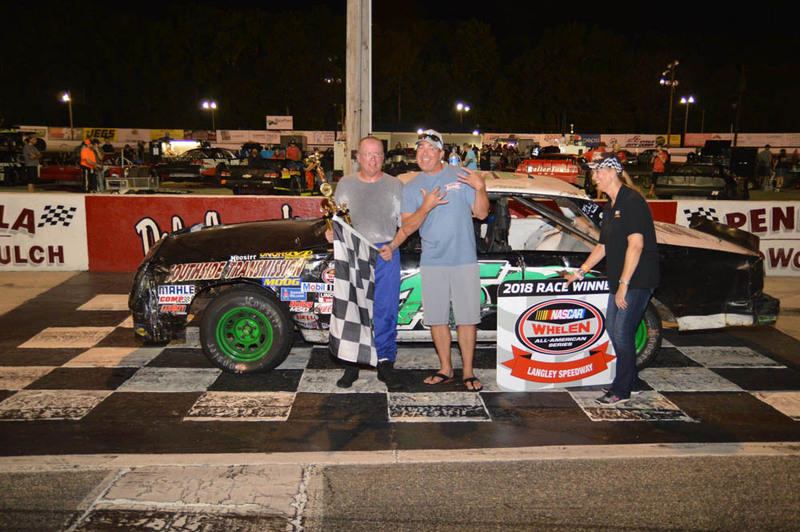 Hampton, VA (8-4-18) For the last several weeks, rain has been the story for much of the local short tracks throughout the entire Mid Atlantic and Larry King Laws Langley Speedway has not been the exception. The Taylor Waste Services Late Models was on hand for twin race features in the evenings race card. 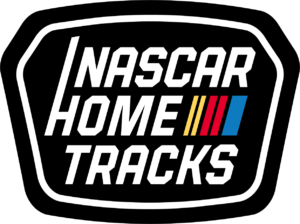 The division had not seen competition in nearly a month and with the Hampton Heat 200 just weeks away, track time is at a premium. For many of the other divisions, the rains have had an impact as well but, on this day, we would race. Highlighting the exciting evening were the ERA Realtor Winged Champ Karts, Old Skool Video Game Super Streets. Also, on the card were the Riverside Paper Pro Six’s, Carroll’s Automotive UCars and welcoming back to the speedway were the Virginia Mini Cup Series in twin race features. With the action set to thrill, who knows what would happen next, here’s a recap of how it all went down. ERA Realtor Winged Champ Karts 20 Laps: Garry Osbourne was back on pole in the Winged Champ Kart division. Surviving seventeen other competitors, Osbourne’s lap at 22.474 seconds bested Aaron Leach’s efforts but none the less a share of the front row. Matthew Leach, Tillman Heuer and Chris Bechtel were the series five best in the afternoon time trials. Green flag would wave for the pole sitter but the inside row did not get a good start. With the outside row on the move, Aaron leach became the lap one leader. But back came the inside row with Garry Osbourne at the helm before the first caution period took to the track. Back to the green saw Aaron Leach showing the way with Tillman Heuer, Matthew Leach and Garry Osbourne all nose to tail. After another caution period to the race, the leaders were back at and just before the halfway saw leaders Aaron Leach and Tillman Heuer break away in a two car battle of their own. Latter stages of the race and back would come the pole sitter Osbourne with Matthew Leach doing the pushing. But nothing doing as Aaron Leach would hold off the charge and win the Winged Champ Kart feature, Aaron Leach from Victory Lane. “Man, I feel bad cause I told Tillman that I was going to give him this one, I had all intent and purpose in doing it. Once I saw Garry back there, it’s all a point’s battle right now, it was a good run”. 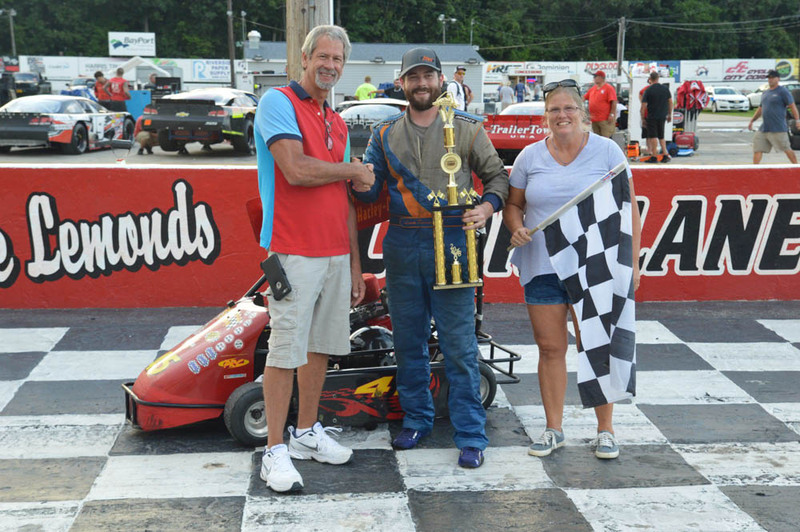 Virginia Mini Cups Twin 25 Laps: In the Virginia Mini Cup series qualifying, Justin Herndon picked up the race pole pacing the .397 oval at 20.280 seconds. Johnny Shonk would get the two spot in the field followed by Dean Johnson, Jim Grandy and Fred Daniels as the five best. With the green waving in the air, Justin Herndon would lead the field into turn one and out of turn two it was Johnny Shonk leading lap one but back would come the pole sitter to lead lap two. Back and forth, side by side the two would battle before Shonk secured the point. Laps later, trouble for the pole sitter Herndon as he had to come to pit road. Bubba Henly from the nine spot on the grid would then occupy the two spot before giving way to Tyler Warriner. But it was all Johnny Shonk in this feature who would go onto win. 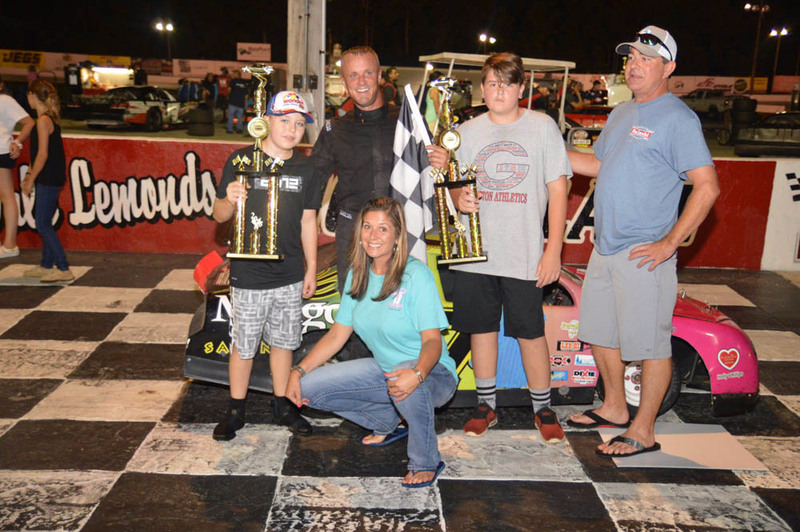 In the second Virginia Mini Cup feature, by virtue of his win, Johnny Shonk was on pole with Tyler Warriner on the outside of row one when the green flag was shown to the field. Shonk would get a great start and easily established his race lead. Bubba Henly was off to a great start as well picking up a spot to second. Just before the halfway, action at the front got hot when Henly started to search for a way around the leader. Race leader Johnny Shonk would do a good job holding off the charge but then a slip from the leader saw Henly on the bumper of the leader. With just a few laps left, Bubba Henly did all he could do but Johnny Shonk would have none of it and would go on to sweep both Virginia Mini Cup features. Johnny Shonk from Victory Lane, “Like to thank the fans, thank Langley Speedway for having us out. Also like to thank Jim Grady Sr and Jim Grady Jr, without them, I couldn’t run out front like this and I really do appreciate it all”. 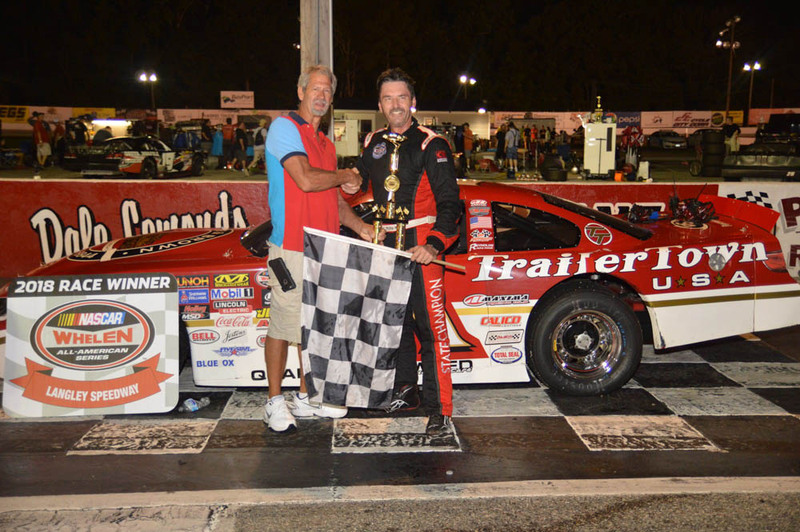 Taylor Waste Services Late Models Twin 75 Laps: Danny Edwards Jr knocked off Philip Morris from the pole in Late Model series qualifying. The pole lap was set at 15.679 seconds, just thirteen thousandths better than Morris’s lap but certainly deserving his place in row one. Showing speed in qualifying was also Peyton Sellers, Connor Hall and Greg Edwards as the top five. With a snap of the arm from the flagman, the green was in the air, the seventeen car field came to life and emerging out of turn two as the leader would be the pole sitter Danny Edwards Jr. 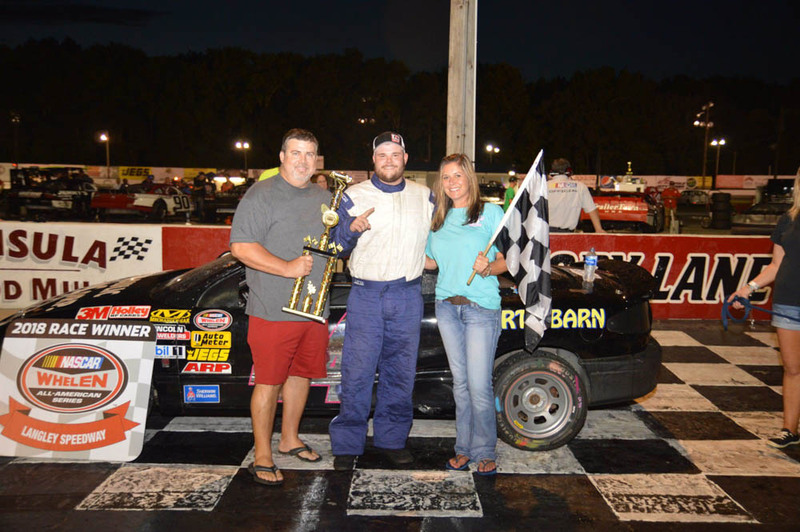 But just after the first lap was completed came the first race caution when Craig Eastep had an issue. Back to the restart, Morris with a much better whole shot from the outside would take the lead from the pole sitter. On back, the battle for third was taking place as Connor Hall was on the move as was Mark Wertz in the top five. Laps later, Morris seemed hooked up and quickly mounted up six car length lead over Danny Edwards Jr. While the early portions of the feature saw the leaders getting away, on back it was Hall, Sellers and Greg Edwards the top five. Halfway in the race, race leader Philip Morris was in firm control, encountering lap traffic but the best battle on the track at this point was between Connor Hall and Peyton Sellers for third. After several bumps, Hall finally took the spot but back would come Sellers with Greg Edwards in tow leaving Hall in fifth when the exchange ended. Meanwhile, the race leader was picking them off one by one in coming through the field and enroute to winning the first Late Model race feature with just four cars on the lead lap. Morris had this to say in Victory Lane, “That thing was incredible”, expressed the race winner. “Hats off to Forrest Reynolds and it was also really hot in there as was looking to go as fast as I could and the car was really good. First time my crew chief ever told me to burn it down so it was fun to go do that. 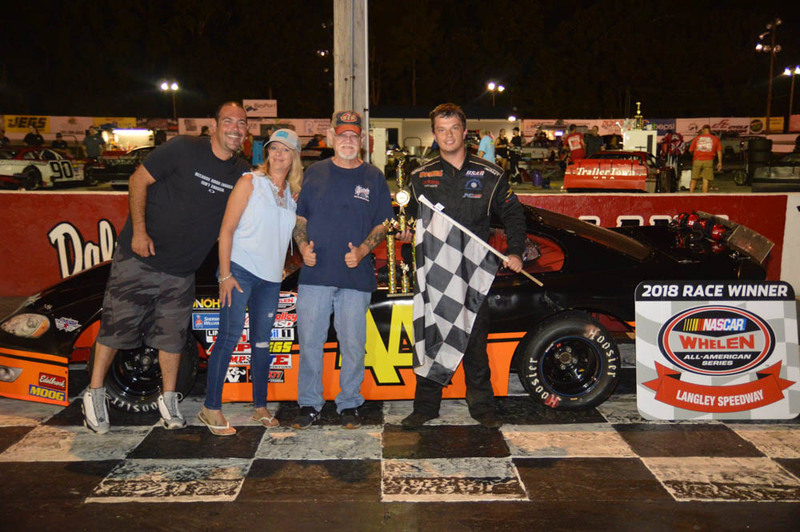 I don’t know what we got for the second race but at least we got a win right here at Langley Speedway, a track were I normally struggle. Gotta thank my crew for this one”. In the Late Model night cap, by virtue of NASCAR’s mandatory eight car invert, race one winner Philip Morris would have to start eighth. Instead, negated the position to start in the rear for max national points handing the race pole to Terry Carroll. With the green flag in the air, Terry Carroll would lead lap one but on lap two, Greg Edwards took a turn. Hard charging Connor Hall wanted in on the action and took his turn at the lead as the early stages were exciting to watch. While race leader Hall and Greg Edwards were getting away, third through tenth were all being contested nose to tail. Mark Wertz soon found himself in the third spot after doing away with the ride of Duane Shreeves settling for fourth. Another driver making moves was Craig Eastep who had made his way into the top five and likely looking for a caution in hopes of running down the leaders. Just shy of the halfway, the caution waved wiping out the lead of Connor Hall and bunching back up the field who perhaps been saving tires. The restart got interesting as Connor Hall made good at his launch, Mark Wertz did also and was now in second. Taking advantage of the cone restart was Danny Edwards Jr and from the rear, Philip Morris was back in the top five as well. Laps later, the battle for second took place as Greg Edwards wanted the spot but Mark Wertz did a great job holding off the charge. Meanwhile, Connor Hall was checking out and loving it. Latter stages of the feature saw Philip Morris get by both Greg Edwards and Mark Wertz for second. Suddenly, the caution waves when Peyton Sellers goes around and wiping away the huge lead of Connor Hall as eighteen laps still remained. Back to the green, the battle for the race lead ensued as Hall could not hold off Morris’s charge from the outside when another caution took the track. Restart once again saw Morris retain the point leaving Danny Edwards Jr and Connor Hall to battle for second. While that battle had yet to be decided, Morris began to amount his lead as only ten laps remained. Hall eventually took the second spot but for Morris, he had checked out and would go on to sweep both Late Model race features. Morris in Victory Lane, “That may have been our best race all year, it just went down to strategy, crew chief, the crew and the engine builder said to ride till I saw lap fifty go on the board. Turned out to be the right choice because I had really worn my tires out the first race. There was just enough left to get myself back to the front”. Carroll’s Automotive UCars 25 Laps: Colby Vance had the speed in UCar series qualifying to earn the pole with his lap at 18.993 seconds. Austin Davis would start his ride in second on the front row followed by Tillman Heuer and Thomas Gildea to complete the UCar division qualifying. Green flag was given to the grid with pole sitter Colby Vance showing the way. Austin Davis would give the pole sitter a quick go at it but at that point, didn’t have much for Vance who then was harassed by Tillman Heuer for the spot. Several laps later, Davis held off Heuer to maintain second but back up front, it was all Colby Vance. At the halfway point, Vance began to expand his race lead by almost a half a straightway as Davis continued to try and chase him down. But in this UCar feature, Colby Vance had them covered as he would go on to win the UCar race feature. Colby Vance from Victory Lane, “Yeah, finally, seems I finish second a lot here at this place. I just can’t thank the Lord above enough for blessing me the opportunities and keeping everyone out there safe. I just can’t thank everyone enough for this opportunity, it’s definitely a good night”. Old Skool Video Games Super Street 40 Laps: Dale Parro was fastest in Super Street qualifying sporting his lap at 18.863 seconds. Sean Calway was up to the challenge of speed but fell short and would start second. Randy Akers, Dale Nichols and Chris Roberts rounded out the five best in the afternoon qualifying session. Green flag was shown and the pole sitter began his march. After a quick caution on lap one, the race resumed with Parro leading the way. Good start for Chris Roberts who would show second in the grid but for the outside row one starter Sean Calway, he would find himself shuffled back to fifth. In what had been a caution fest race so far, race leader Dale Parro was clearly in control but pacing his every move continued to be Chris Roberts. 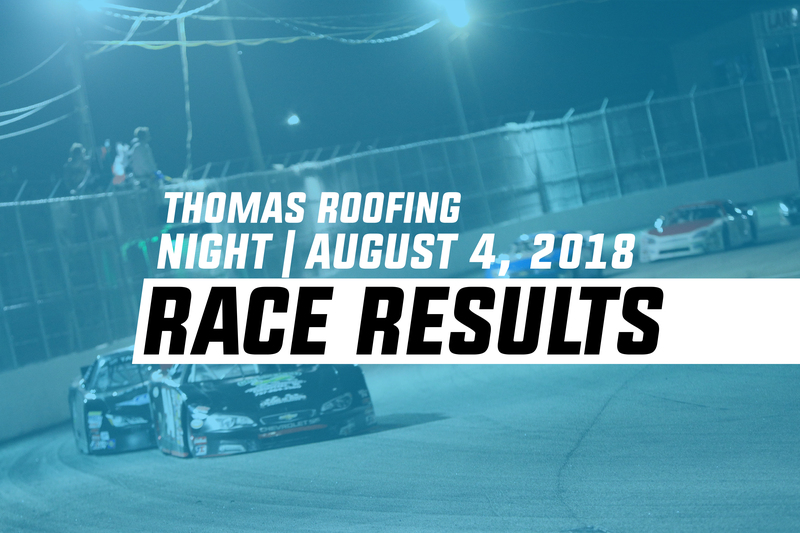 As the result of several cautions, the race saw Gordon Weeks and Chris Roberts take turns as the leader leaving Dale Parro likely frustrated in second. Halfway in the feature saw the battle for the lead ensue as Parro would search for a way around the leader Roberts. Battle for third had heated up too as it was all Weeks could do to hold of Danny Harrell and Randy Akers but soon Weeks fell back to fifth. After several more cautions to the event, the late laps saw Parro as the leader with just two laps to go and a much anticipated restart. Green flag waved and the battle for the race win was on. Dale Parro and Chris Roberts muscled each other but on the last lap, Parro secured the point. To the stripe, Roberts could not close as more wrecking went on behind them, Dale Parro wins the Super Street feature. Parro from Victory lane, “Yeah, its awfully hot out there, I was warned about starting to soon on the white line. So, I did what he said to do and the guy next to me jumps it so you know, what are you supposed to do? Riverside Paper Pro Six 30 Laps: In the Pro Six division qualifying, Travis Wall knocked off Adam Florian’s hot wheel from taking the pole. Wall’s lap at 17.105 seconds bettered Florian’s but none the less, a start on the front row. With the green waving, Travis Wall would show the field into turn one. Out of turn two, Wall had secured the lead doing quick work on the Pro Six series dominator Adam Florian in second. Several laps into the race feature, race leader Travis Wall developed a serious miss in his engine but was still able to maintain his race lead. At the halfway, perhaps the miss was becoming more significant as Adam Florian was running down the leader and in a hurry. Meanwhile, Jared Clarke was slowly closing in on JB Sipe for third but back up front with just a handful of laps remaining, Adam Florian was there and on the leader. Then Wall’s lead opened back up shutting down Florian’s charge, flag to flag, sick motor and all, Travis Wall wins! Wall in Victory Lane, “I mean at least it wasn’t an up and down season I mean we’ve been right there on his heels every single race. Man, me and Adam have been having some great racing all year so it’s cool to come out on top, get the pole, get the win. We got a little gap on him then the motor started to act up a little bit but were figuring it out, with this new car were doing pretty good right now”.